Description: The SA35 moves the engines back to the train after drilling Dinaso Lumber. This GP40-2 now owned by CSX is missing some of the lettering on the short hood. Description: One of the Lakewood locals runs the crossing as the SA35 makes its way through Lakewood, NJ. Description: CSX D750-19 is coming straight at us, as it is about to duck beneath the NS Cleveland Line. Description: Running long Hood forward Notice the flares on the sides of the diamond. Description: This Move was tring to beat the UP pacer train to the interlocker but lost. 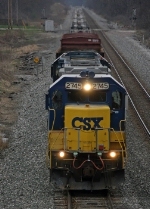 Description: CSX GP38-2 2745 trails on Y129 South. Description: 2745 idling in the yard at Fostoria. Title: Geep Qaurtet Delivering Pressurized Hoppers to Gypsum. Title: Ah four axle power at its finest! Description: CSX K486 enters Tuscola, Illinois with a SERIOUS power set. All units were indeed online. Description: Probably cars for A. Schulman in Akron. Title: Local returns east light. 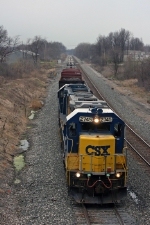 Title: CSX 7370, 8236 & 2745. Description: A herd of csx geeps handle a empty ethanol train north on the cn. Description: CSX GP38-2 2745 in the consist on C746-21 as they headed east out of Woodbourne Yard. Description: Q418-27 takes headroom out of Woodbourne Yard in order to set out a leaking tank car (non-hazmat thankfully!) in the yard with CSX C40-8 7592 leading an AC44CW and GP38-2. Description: CSX GP38-2 2745 is the third unit on Q418-27, soon to head out of town. Description: With their pick-up done and the bad-order dropped off, Q418-27 chugs east out of Woodbourne Yard.